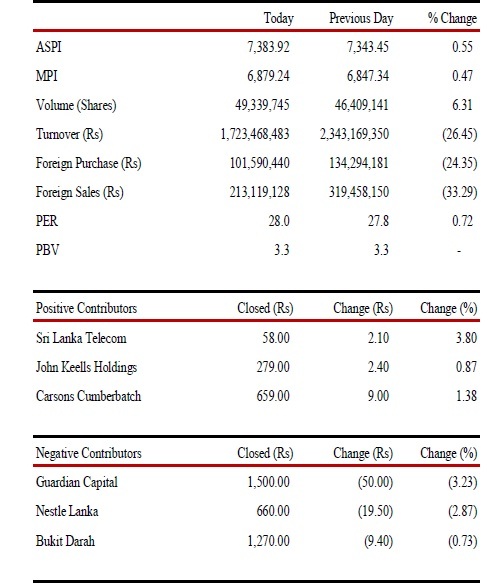 A buying momentum during the latter half recovered indices marginally at Colombo Stock Exchange on Monday the 28 March 2011 after the initial downtrend. However, All Share Price Index (ASPI) closed in red while Milanka Price Index (MPI) managed to stay stagnant amidst interest witnessed in index heavy Commercial Bank (COMB) and John Keells Holdings (JKH). Prices of blue chip counters are expected to pick up in the coming few days amidst low turnover levels. The All Share Price Index (ASPI) closed at 7,210.09, down 0.42% by 30.18 points and the Milanka Price Index (MPI) was barely changed at 6,838.41 points. Turnover was at Rs.1.6 billion tumbled 30.43% with a total volume of 49.51 million shares changing hands (fell 56.11%).Foreign purchases rose 31.20% to Rs.147.55 million and foreign sales fell 45.55% to Rs.226.24 million. Price to forward Earnings Ratio (PER) depreciated by 0.39% to 25.6 times. Bank, Finance & Insurance sector was the main contributor to the market turnover due to Commercial Bank (COMB), Sampath Bank (SAMP) & Central Finance (CFIN) with sector index increasing 0.65%. Stores & Supply sector also contributed to the market turnover with sector index decreasing 1.14%. Sector turnover was boosted by Colombo Pharmacy (PHAR) with 9 crossings of 54,000 shares at Rs.3,500 in which profit taking was witnessed after making a quick gain last Friday. The share price decreased by Rs.31.10 (0.88%) and closed at Rs.3,427. Investors reacted positively to an announcement made by East West Properties (EAST) on a revaluation of its properties (increase of net assets by Rs.695 million. Several Crossings were recorded including Commercial Bank (COMB) 430,000 at Rs.270, Sampath Bank (SAMP) 235,828 shares at Rs.285 and Seylan Bank (SEYB) 275,000 shares at Rs.74 per share. 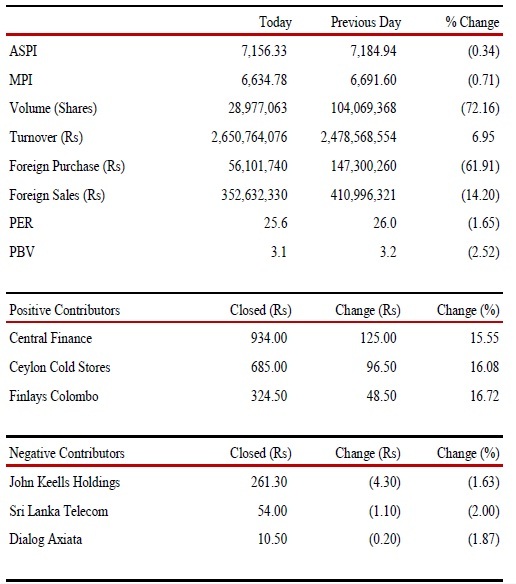 Colombo Stock Indices gained while volume levels picked up marginally on Friday the 25 March 2011, All Share Price Index (ASPI) and Milanka Price Index (MPI) ended the week gaining 0.77% and 2.19% respectively. “With the Financial Year end reaching on coming week, we expect the prices to gain next week, although recording low turnover levels.” Brokers said. The All Share Price Index (ASPI) closed at 7,240.27 points, topped 0.33% by 23.52 points and the Milanka Price Index (MPI) increased 0.65% through 44.43 points closing at 6,838.02 points during the day. Total turnover rose to Rs.2.31 billion (fell 17.48%) and a total volume of 112.79 million shares changed hands (up 25.58%). Foreign purchases increased 35.57% to Rs.112.46 million and foreign sales shot up 79.13% to Rs.415.48 million. Price to forward Earnings Ratio decreased 0.39% to 25.7 times. 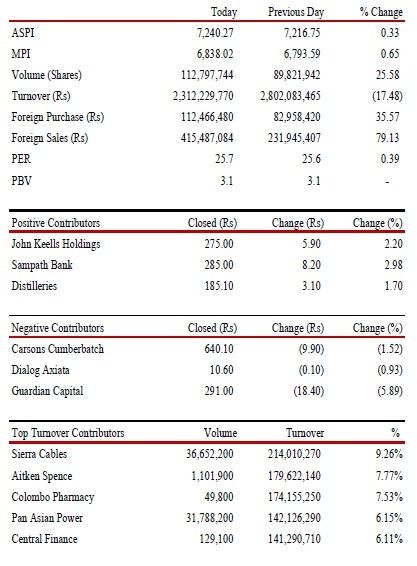 Diversified sector was the main contributor to the market turnover due to Aitken Spence (SPEN) and Richard Pieris (RICH) with sector index increasing 0.22%. Manufacturing sector also contributed to the market turnover with sector index increasing 0.73%. The gain in the sector was mainly due to Sierra Cables (SIRA) in which an aggressive accumulation was witnessed towards the end of trading. The share price increased by Rs.1.20 (25.53%) and closed at Rs 6.20. Distilleries (DIST) continued to attract investors amidst the purchase of a 47% stake of Pelawatte Sugar (SUGA) on earlier day. Plantation sector was on the up amidst a recovery in the rubber prices. ASPI gained amidst the exceptional appreciations of illiquid shares such as Ascot Holdings (ASCO) and Colombo Pharmacy (PHAR). Several crossings were done during market hours including 699,100 shares of Aitken Spence (SPEN) at Rs.163, Colombo Pharmacy (PHAR) 6,000 shares at Rs.3,500, Pan Asian Power (PAP) 30 million shares at Rs.4.50, Distilleries (DIST) 5 million shares at Rs.13.80, HNB Bank non-voting (HNB.X) 225,000 shares at Rs.209,Hemas Holdings (HHL) 522,500 shares at Rs.46 and Ceylinco Insurance (CINS) 32,000 shares at Rs.730 per share with 132,400 shares of Royal Ceramics (RCL) at Rs.156 per share. Guardian Capital (WAPO) made further gains on Thursday the 24 march 2011 pushing the All Share Price Index up. The company consists of only a cash base of under Rs.550 million although, at the current share price (Rs.318) the company is valued at over Rs.8 billion at an unbelievable premium of over 15 times according to brokers. The All Share Price Index (ASPI) closed at 7,216.75 points, rose 0.13% by 9.65 points and the Milanka Price Index (MPI) topped 0.26% by 17.72 points closing at 6,793.59 points. 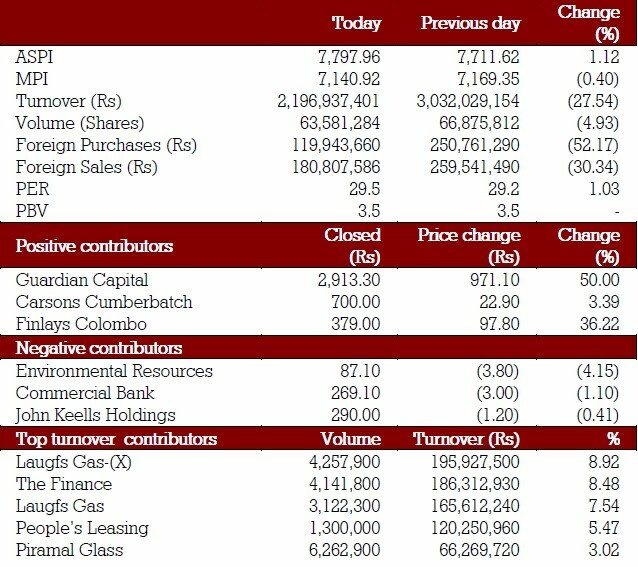 Total turnover was at Rs.2.8 billion fell 0.62%, with a total volume of 89.82 million shares changing hands (up 1.02%). Foreign purchases tumbled 23.57% to Rs.82.95 million and foreign sales fell 51.44% to Rs.231.94 million during the market hours. Price to forward Earnings Ratio (PER) slightly rose 0.39% to 25.6 times. of Pelwatte Sugar (SUGA) at Rs.27.50 per share. As a result, investors reacted positively to Distilleries. Profit taking was witnessed on the finance sector counters, Central Finance (CFIN) and LB Finance (LFIN), which pushed up the indices over the last couple of days. Gains recorded in blue chip counters John Keells (JKH) and Dialog (DIAL) pushed the Milanka Price Index up. Several crossings were recorded during the day including Distilleries (DIST) 250,000 shares at Rs.183, Lanka Walltile (LWL) 530,000 shares at Rs.175, Ceylinco Insurance (CINS) 51,900 at Rs.730 and Nation Lanka Finance-Rights (CSF.R) 5,202,400 shares at Rs.3 .90 per share. be the bull run expected up to the Financial Year end in 31 March 2011 according to brokers. Milanka Price Index (MPI) recorded a welcome gain. The All Share Price Index (ASPI) closed at 7,207.10 points; dipped 0.18% by 13.16 points and the Milanka Price Index (MPI) increased 1.18% by 79.08 points closing at 6,775.87 points during the day. 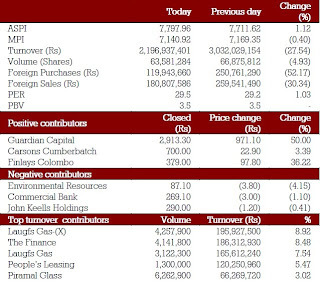 Total turnover recorde to be Rs.2.98 billion fell 17.46% with a 49.61 million shares changing hands (fell 6.17%). Foreign purchases dropped 21.79% to Rs.108.53 million and foreign sales dropped 54.11% to Rs.477.6 million. Howver, Price to forward Earnings Ratio decreased 0.39% to 25.5 times. Banking, Finance and Insurance sector contributed significantly to the market turnover mainly due to LB Finance (LFIN) and Central Finance (CFIN) with sector index increasing 3.04%.LB Finance (LFIN) made the highest contribution to the market turnover. The share price increased by Rs.19.50 (11.50%) and closed at Rs’187. Profit taking was witnessed in Central Finance (CFIN after making rapid gains on earlier day. Manufacturing sector also contributed to the market turnover amidst renewed interest witnessed in Royal Ceramics (RCL). The sector index increased by 0.78%. Aggressive retail participation was witnessed in Carsons owned dud company Guardian Capital Partners (WAPO) towards the closure of the market. Marginal decline in All Share Price Index during the day was due to the drastic drop in the share price, as the new WAPO shares started trading subsequent to the 75 for 2 rights issue. “The share is still overvalued in our opinion.” NDB Stock Brokers said in their daily review. Several crossings were doe including two crossings of Distilleries (DIST) 199,930 shares at Rs.181 and 120,000 shares at Rs.180, Hayleys (HAYL) 270,000 shares at Rs.388, Aitken Spence Hotels (AHUN) 500,000 shares at Rs.96 per share. 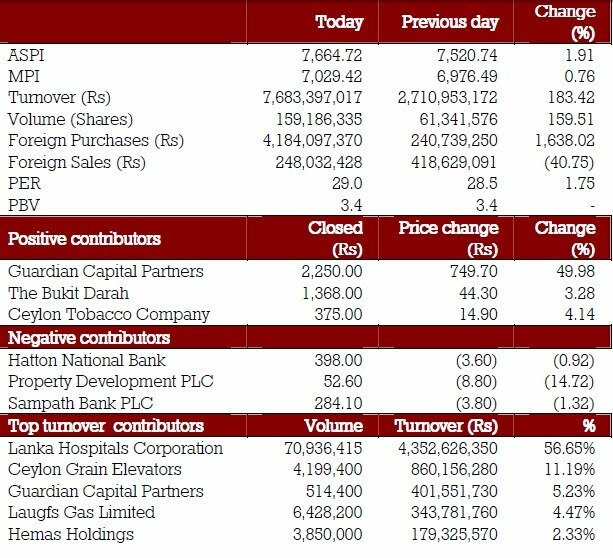 Colombo Stock Indices gained on Tuesday the 22 March 2011 amidst exceptional gains made by a few financial and banking counters. The sudden rise in those stocks cannot be explained by fundamentals according to brokers. The All Share Price Index (ASPI) closed at 7,220.26 points, rose 0.89% by 63.93 points and the Milanka Price Index (MPI) closed at 6,696.79 points, topped 0.93% by 62.01 points during the day. Total turnover was at Rs.3.612 billion (rose 36.28%) with a total volume of 42.71 million shares changing hands (topped 47.4%). Foreign purchases rose 147.37% to Rs.138.77 million and foreign sales rose 195.16% to Rs.1.04 billion. Price to forward Earnings Ratio (PER) remained stable at 25.6 times and there were 130 gainers and 62 losers for the day. 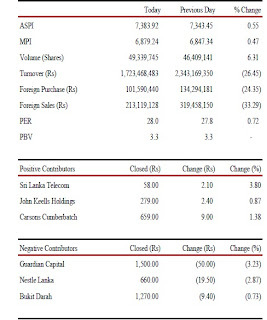 Banking, Finance and Insurance sector contributed significantly to the market turnover mainly due to Sri lanka’s No.1 insurance giant Ceylinco Insurance (CINS) and Central Finance (CFIN) with sector index increasing 3.04%. Ceylinco Insurance (CINS) made the highest contribution to the market turnover with 11 crossings amounting to 2,193,100 shares at Rs.750 per share. The share price increased by Rs 82.60 (1.81%) and closed at Rs.740. Foreign holding of the company decreased by 1,144,300 shares.It was anticipated by market sources that Prabhash Subasingh owned Global Rubber Industries Ltd. and Global Sea Foods Ltd bought the stake. Guardian Capital Partners (WAPO) recorded exceptional gains once again despite the absence of a solid reason. Central Finance (CFIN) and LB Finance (LFIN) also made rapid gains. Investors reacted to some extent to yesterday’s dividend announcement of Namunukula Plantations (NAMU) and Kotagala Plantations (KOTA). After some volatility in early trading on Monday the 21 March 2011, market became stagnant to close the indices on red, reflecting the continued negative momentum. Volume levels remained low amidst dull investor sentiment. Turnover was boosted by the change of hands of a substantial stake of Central Finance (CFIN). The All Share Price Index (ASPI) closed at 7,156.33 points, dipped 0.40% by 28.61 points and Milanka Price Index (MPI) dropped 0.85% through 56.82 points closing at 6,634.78 points, during the day. Total turnover was at Rs.2.65 billion ( rose 6.95%) and a total volume of 28.97 million shares changed hands (decreased 72.16%). Foreign purchases dipped 61.91% to Rs.56.1 million and foreign sales further fell 14.2% to Rs.352.63 million. Price to forward Earnings Ratio (PER) declined 1.65% to 25.6 times. Banking, Finance and Insurance sector contributed significantly to the market turnover with sector index decreasing 0.12%. Contribution from the sector accounted for around 66% of the total turnover during the day. This was mainly due to the negotiated deal including 1.6 million shares at Rs.800 of Central Finance (CFIN) which was sold by Sri Lanka Insurance (SLIC) to Arjun Aloysius led Perpetual Capital. The share price of the company increased by Rs.125 (15.55%) and closed at Rs.934. Diversified sector also contributed to the market turnover mostly due to Hayleys (HAYL). The sector index decreased by 0.36%. Laugfs Gas (LGL) announced an interim dividend of Rs 1.50 per share while Ceylon Grain Elevators (GRAN) announced an interim dividend of Rs.1 per share. Namunukula Plantations (NAMU) and Kegalle Plantations (KGAL) also announced interim dividends of Rs.1.00 per share and Rs.2.50 per share respectively. Investors’ reaction to the dividends announcements was comparatively negligible except for someresponse for Laugfs Gas (LGL) according to brokers. Another three crossings were completed during the day including 268,712 shares of HAyleys (HAYL) at Rs.390 per share, 1,906,600 shares of Pan Asia Bank (PABC) at Rs.50 per share, 74,200 shares of Bukit Darah via two crossings at Rs.1,250 per share. 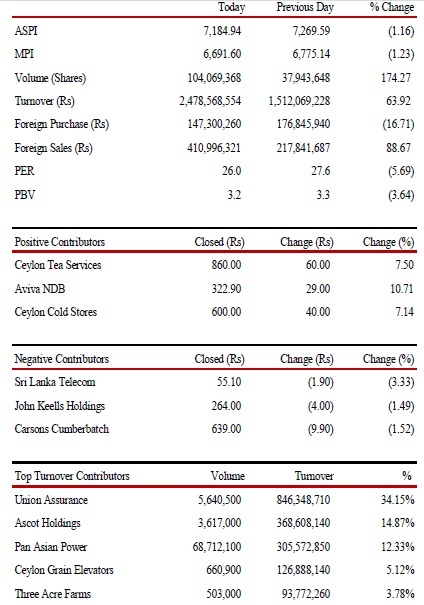 Colombo Stock Prices gained tentatively in early trading on Friday the 18 March 2011 only to tumble later on. As expected the demand that was seen over the last two days got faded during the day. The volatility and low turnover levels may continue next week according to brokers. Credit restrictions at broking houses taking effect from 31st March may result in selling. “However buying may also be visible with the financial year ending on the 31st March and the need to window dress equity portfolios.” Brokers added. The All Share Price Index (ASPI) closed at 7,184.77 points, dipped 1.17% by 84.82 points and the Milanka Price Index (MPI) closed at 6,693.92 points, fell 1.20% through 81.22 points during the day. Turnover recorded to be Rs. 2.47 billion rose (63.92%) with a volume of 104 million shares changing hands (up 74.27%). Foreign purchases tumbled 16.71% to Rs.147.3 million and foreign sales rose 88.67% Rs.410.99 million. Meantime, Price to forward Earnings Ratio declined by 5.69% to 26 times. ASPI and MPI dipped 1.75% and 1.91% respectively for the week. Banking, Finance and Insurance sector, being the highest contributor to the market turnover accounted for around 40% of the total turnover for the day. 5,604,000 share stake of Union Assurance (UAL) held by Aviva NDB Insurance (CTCE) was acquired by John Keells Holdings (JKH) at Rs.150. The share price of UAL decreased by Rs.10.30 (5.86%) and closed at Rs.165. Aviva NDB Insurance share price appreciated in view of the capital gain made. Investment Trusts sector also contributed significantly to the market turnover amidst institutional or high networth participation in Ascot Holdings (ASCO). Foreign investor stake in Pan Asian Power of 11,703,150 shares was sold and a total of 60 million shares were bought by Palace Path Holdings (Pvt) Ltd. for Rs.4.50 per share. 600,000 shares of Ascot Holdings (ASCO) changed hands at Rs.92 with 1,000,100 shares crossing at Rs.100 and another 2,00,000 shares crossing at Rs.110 per share. Royal Ceramics (RCL) 200,000 shares were crossed at Rs.150 per share and 37,800 of Carsons (CARS) changed hands for Rs.645 per share as at end of trading day. Sri Lanka stocks closed fairly positive on Thursday the 17 March 2011 and a demand seems to be created to negate the negative sentiment that prevailed over the last few weeks. 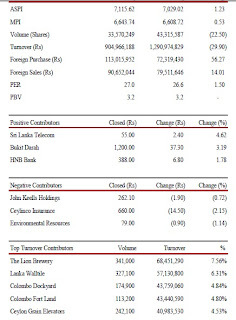 However, low turnover suggests the trend may be temporary in Colombo Stock Exchange. “Accumulation of blue chips was witnessed to a certain extent with marginal institutional or high networth investor participation.” Brokers said. The All Share Price Index (ASPI) closed at 7,269.59 points, topped 2.16% by 153.97 points and the Milanka Price Index (MPI) closed at 6,775.14 points, rose 1.98% by 131.40 points. 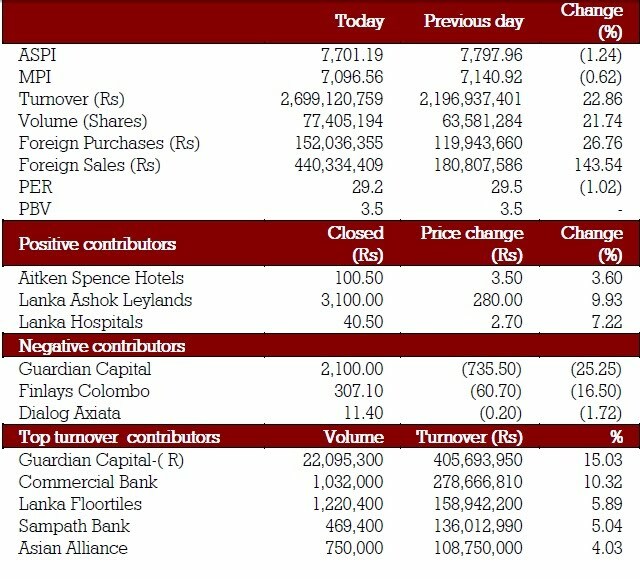 Total turnover was at Rs.1.5 billion (rose 67.42%) and a total volume of 37.94 million shares changed hands (rose 13.03%). Foreign purchases rose 56.48% Rs.176.84 million and foreign sales rose 40.31% to Rs.217.84 million. Price to forward Earnings Ratio rose 2.22% to 27.6 times. weeks, Colombo Fort Land (CFLB) and Richard Pieris (RICH).The sector index increased by 2.10%. 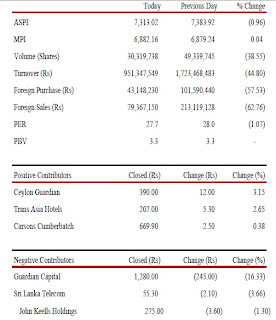 Several crossings recorded including John Keells Holdings (JKH) 86,500 shares at Rs.265, Aitken Spence Hotels (AHUN) 600,000 at Rs.96, Aitken Spence & Co. (SPEN) 150,000 shares at Rs.163.00, Ceylon Investment (CINV) 250,000 shares at Rs.149.70, Lanka Walltile (LWL) 120,000 shares at Rs.174.90 per share. Manufacturing sector also contributed significantly to the market turnover with interest seen in Ceylon Grain Elevators (GRAN). The sector index increased by 2.95%. The share price of Ceylon Grain Elevators increased by Rs.16.60 (9.98%) and closed at Rs.187. At this price the share is trading at a P/E of 22 times compared to the market P/E of 20 times (based on Financial Year 2010 results). Hotel Sigiriya (HSIG) announced an interim dividend of Rs 1.50, which attracted investors marginally. 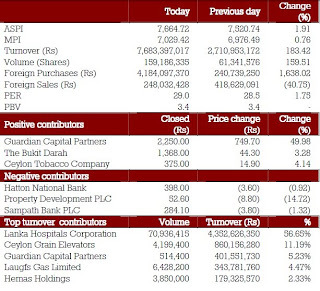 A fresh buying session at Colombo Stock Exchange pushed the indices up during early trading on Wednesday the 16 March 2011. Prices were stagnant thereafter amidst a dull sentiment. Low turnover and activity levels indicate both buyers and sellers are uncertain regarding the direction according to brokers. Stability at current price levels will gradually improve the turnover over the next few weeks brokers opined. The All Share Price Index (ASPI) closed at 7,115.62 points, rose 1.23% by 86.60 points and the Milanka Price Index (MPI) closed at 6,643.74 points, topped 0.53% through 35.02 points during the day. 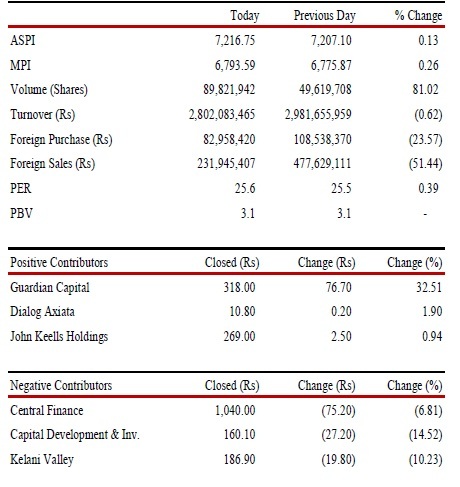 Total turnover was Rs.904.96 million dropped 29.9% with a volume of 33.57 million shares changing hands (down 22.5%). Foreign purchases rose 56.27% to Rs.113 million and foreign sales rose 14.01% to Rs.90.65 million. Price to forward Earnings Ratio (PER) slightly rose 1.5% to 27 times. A dud company, Lanka Cement (LCEM) a highly illiquid share which runs in Colombo course once in every three months due to market news on opening of its long stalled Kankesanthurai cement plant this time went up again and closed at Rs.26.50 (Rs.1.30 increase) due to a hype that said the company is in talks with a Chinese firm to construct a 25-storey office and shopping complex valued at about Rs.5.0 billion and is also looking for a local investor to re-build a defunct cement factory Kankesanthurai. sector also contributed significantly to the market turnover due to Colombo Fort Land (CFLB) mainly, with the sector index gaining 0.48%. 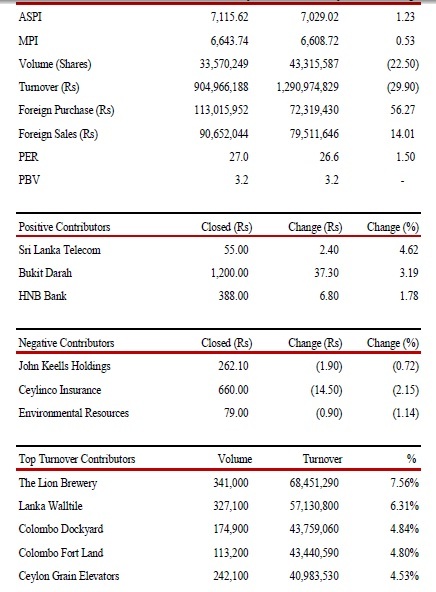 The Lion Brewery (LION) made the highest contribution to the market turnover. The share price increased by Rs.8.90 (4.66%) and closed at Rs.200. Renewed interest of retail investors was witnessed in Lanka Walltile (LWL) and Colombo Fort Land (CFLB). Two crossings were done of Lion Brewery (LION) 200,000 shares at Rs.202.00 and 100,000 shares of Colombo Dockyard (DOCK) 100,000 at Rs.250 per share. The past few days have seen certain counters switching between negative and positive contributors to the indices, which indicate the short term focus of retail investors. The All Share Price Index (ASPI) in Colombo started heading back towards 7,000 points on Tuesday the March 15 2011 after passing the mark during early January. However the Milanka Price Index is coming down at a lower rate comparatively, as it remained stagnant during the period in which the ASPI made rapid gains. “The market needs to stabilize over the next few months as the last few months have been excessively volatile” brokers said. The All Share Price Index (ASPI) closed at 7,029.02 points, dropped 1.96% by 140.74 points and the Milanka Price Index (MPI) closed at 6,608.72 points, tumbled further down 1.63% through 109.35 points during the day. 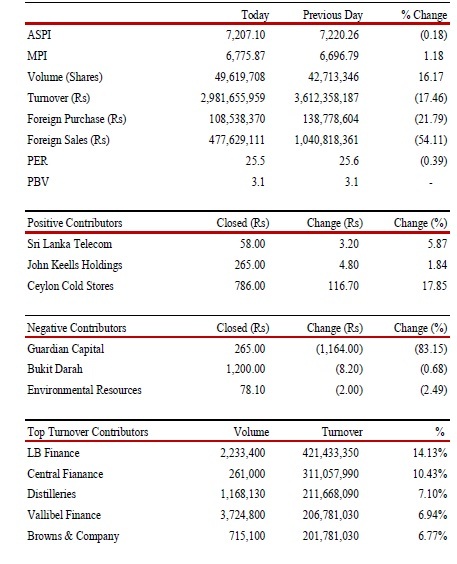 Total turnover was at Rs.1.29 billion rose 36.52% with a total volume of 43.31 million shares changing hands (up 30.2%). Foreign purchases fell 3.96% to Rs.72.31 million and foreign sales rose 36.26% to Rs.79.511 million. Meantime, Price to forward Earnings Ratio (PER) dropped 2.21% to 26.6 times. Nearly 1.5 million shares of Ceylon Grain Elevators crossed via 4 crossings at Rs.165 per share. 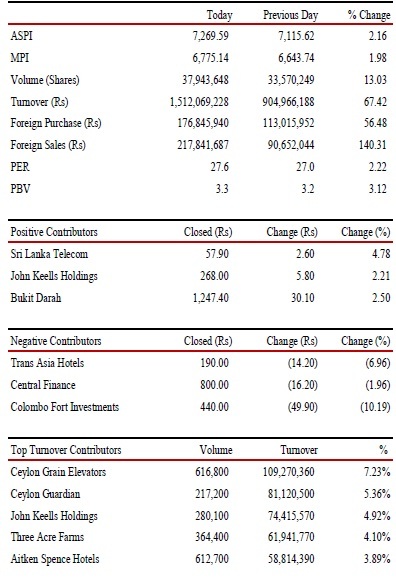 Manufacturing sector was the highest contributor to the market turnover mainly due to Ceylon Grain Elevators (GRAN). The sector index dropped by 1.37%. Bank, Finance & Insurance sector also contributed significantly to the market turnover with the sector index declining 0.68%. Ceylon Grain Elevators (GRAN) made the highest contribution to the market. The share price decreased by Rs. 5.80 (3.38%) and closed at Rs. 165. Ceylinco Insurance (CINS) and Lanka Hospitals (LHCL) attracted investors while price gains still can be seen in certain illiquid stocks at a time fundamentally strong stocks are yet to attract investors as per brokers. 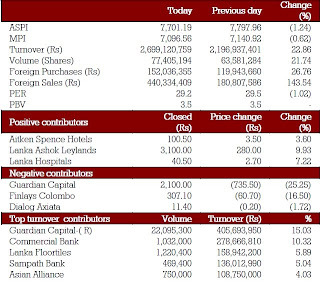 Colombo Stock Market activity was lackluster on Monday the 14 March 2011 as institutional and high networth investors continued to be on the sidelines. Short term profit taking has brought down indices over the last couple of weeks. A period of consolidation was due in view of the rapid gains made since December according to some brokers. The All Share Price Index (ASPI) closed at 7,169.76 points, down 1.96% by 143.26 points and the Milanka Price Index (MPI) closed at 6,718.07 points, fell 1.53% through 104.09 points, as at end of trading day. Total turnover was at Rs.945 million fell 0.6% with 192 listed losers and 22 listed gainers. Foreign purchases rose 74.52% Rs.75.3 million and foreign sales fell 26.48% to Rs.58.3 million. Price to forward Earnings Ratio (PER) declined 1.81% to 27.2 times. Manufacturing sector due to Piramal Glass (GLAS) and Diversified sector due to Richard Pieris (RICH) sectors were the highest contributors to the market turnover while both sector indices decreased by 2.10% and 2.17% respectively. 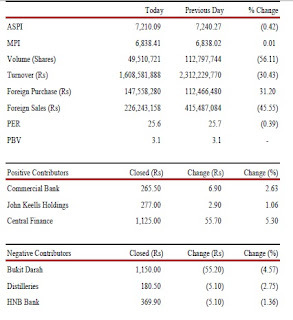 Piramal Glass (GLAS) made the highest contribution to the market. The share price decreased by Rs. 0.50 (4.35%) and closed at Rs 11. 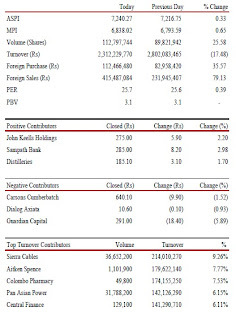 Carsons (CARS) and Bukit Darah (BUKI) continued to dip although their subsidiary, The Good Hope (GOOD) , appeared amongst the top three positive contributors. Other subsidiaries, Selinsing (SELI), Indo Malay (INDO) and Shalimar (SHAL) also appreciated with low turnover. 1.43 million shares of Richard Peiris (RICH) crossed at Rs.14 per share and 127,000 shares of CIC Holdings (CIC) crossed at Rs.158 per share during the day. Further consolidation/correction of the market may see foreign investor inflows gradually increase according to brokers. 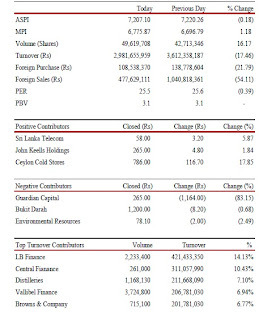 Colombo Stock Indices continued to fall with thin volumes on Friday the 11 March 2011, while Investor participation was subdued throughout the week and comparatively less turnover levels were witnessed. Market ended the week in red, with All Share Price Index (ASPI) and Milanka Price Index (MPI) dipping 5% and 3% respectively. The All Share Price Index (ASPI) closed at 7,313.02 points, dropped 0.96% through 70.90 points and the Milanka Price Index (MPI) closed at 6,822.16 points, fell 0.83% by 57.08 points during the day. 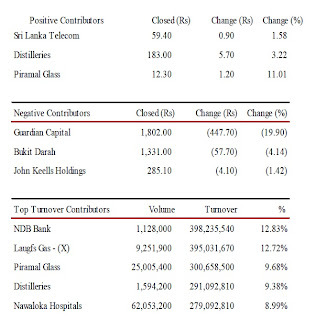 Total turnover was at Rs.951 million (fell 44.8%) with 58 gainers and 138 listed losers. A total volume of 30.3 million shares changed hands (dipped 38.55%) while foreign purchases decreased 57.53% to rs.43.1 million and foreign sales further dipped 62.66% Rs.79.3 million. Meanwhile, Price to forward earnings Ratio (PER) depreciated 1.07% to 27.7 times. Banks, Finance & Insurance sector due to Ceylinco Insurance (CINS) and First Capital (CFVF) and Land & Property sector due to York Arcade (YORK) sectors were the highest contributors to the market turnover while both sector indices decreased by 0.41% and 0.94% respectively. One crossing of 320,000 shares of Chemical Industries (CIC) was recorded at Rs.160 per share. Hotel sector was slightly up due to Trans Asia Hotels (TRAN) and Hotel Developers (HDEV) despite the overall negative sentiment. York Arcade (YORK) made the highest contribution to the market. The share price increased by Rs.4.10 (11.33%) and closed at Rs.39.10. Indices gained slightly on Thursday the 11 march 2011, after Colombo All Share Price Index (ASPI) shed 321 points and Milanka Price Index lost 182 points over the last 3 days. While undervalued stocks do exist, the rise of certain illiquid stocks seems to have overheated the overall market according to brokers. The All Share Price Index (ASPI) closed at 7,383.92 points, slowly picked up 0.55% through 40.47 points and the Milanka Price Index (MPI) closed at 6,879.24 points, rose 0.47% by 31.90 points during the day. 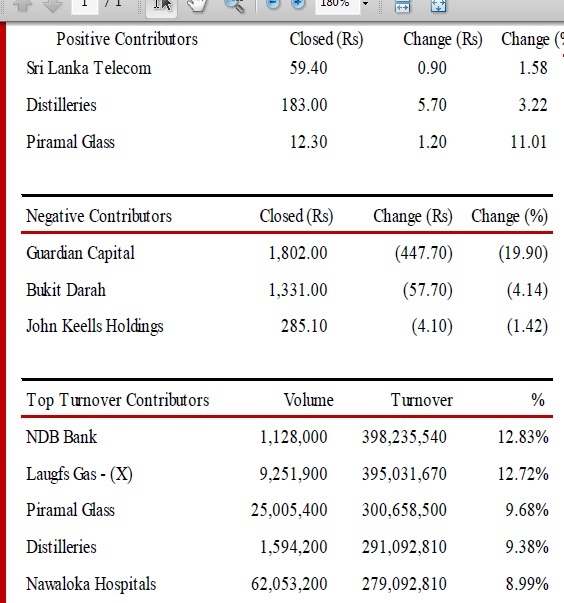 Total turnover was at Rs.1.7 billion fell 26.45% with 146 gainers and 62 listed losers. A volume of 4.9 million shares changed hands (up 6.31%) while foreign purchases tumbled 24.35% Rs.101.59 million and foreign sales further dropped 33.29% to Rs.213.11 million. Price to forward Earnings Ratio (PER) appreciated 0.72% to 28 times. Diversified sector due to John Keells Holdings (JKH) and The Colombo Fort Land (CFLB) and Construction & Engineering due to Lankem Developments (LDEV) sectors were the highest contributors to the market turnover while both sector indices increased by 0.85% and 1.08% respectively. Lankem Developments (LDEV) continued to attract investors making the highest contribution to the market. The share price increased by Rs.16.40 (34.82%) and closed at Rs 64.Distilleries (DIST) announced an interim dividend of Rs.0.50 per share while Haycarb (HAYC) also announced an interim dividend of Rs.3.00 per share. The Colombo Fort Land & Building (CFLB) witnessed selling despite a subdivision announcement. Guardian capital (WAPO) and Bukit Darah (BUKI) continued to lose the rapid gains made in the recent past. 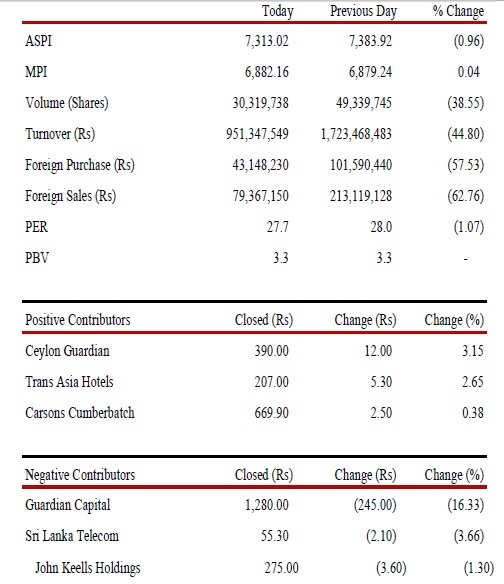 Colombo stock indices increased due to the rise in prices of a selected group of illiquid stocks on Wednesday the 9 March 2011. However, a correction was expected due to the rapid increase in indices over the last few weeks according to brokers. “The current correction is bringing down the prices of other stocks as well.” Brokers said. The All Share Price Index (ASPI) closed at 7,343.45 points, fell 1.38% by 102.45 points and the Milanka Price Index (MPI) dropped 1.24% through 86.02 points closing at 6,847.34 points during the day. 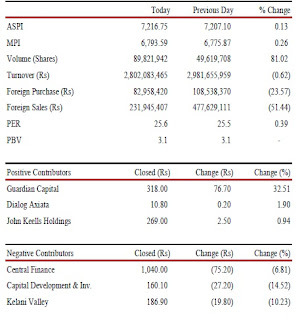 Total turnover was at Rs.2.3 billion increased 18.96% with 162 losers and 34 listed gainers. A total volume of 46.4 million shares changed hands (fell 20.57%) and foreign purchases recorded to be a Rs.134. 29 million (rose 49.78%) and foreign sales fell 23.6% to Rs.319.4 million. Price to forward Earnings Ratio (PER) decreased by 1.42% to 27.8 times. Both indices in Colombo dipped continuing the prevailing negative momentum. All sector indices decreased amidst force selling and profit taking across the board. Diversified sector due to John Keells Holdings (JKH) and Manufacturing sector due to Royal Ceramics (RCL) were the highest contributors to the market turnover while both sector indices decreased by 1.54% and 1.62% respectively. Premier conglomerate John Keells Holdings (JKH) made the highest contribution to the market with ten crossings including 944,500 shares at Rs.280 and 1,182,000 shares at Rs.275). The share price decreased by Rs.7.20 (2.55%) and closed at Rs.275.20. Lankem Development (LDEV)attracted investors amidst a proposal from the company to acquire an equity stake of 61.88% of Agarapatana Plantations from Lankem Plantation Holdings and Kotagala Plantaions. The ASPI dipped more than 100 points amidst a session of heavy selling across the board on Tuesday the 8 March 2011. Low turnover suggests the large investors may be observing in the sidelines according to brokers. The All Share Price Index closed at 7,445.90 points, dipped 1.80% by 136.65 points and the Milanka Price Index (MPI) closed at 6,933.36 points, dipped 1.18% through 82.51 points. A total volume of 58.4 million shares changed hands (dropped 56.14%) while the turnover was at Rs.1.9 billion (36.55%). Foreign purchases decreased 84.97% to Rs.89.66 million and foreign sales Rs.418.12 million dipped 28.5%. Price to forward Earning Ratio (PER) depreciated by 1.74% to 28.2 times. 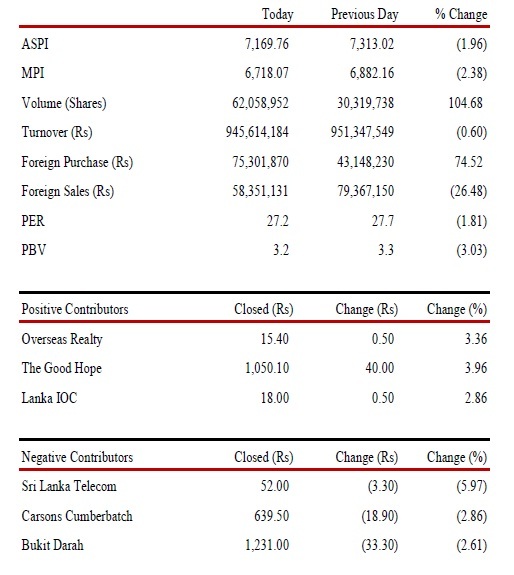 Diversified sector due to John Keells Holdings (JKH) and Manufacturing sector due to Lanka Floortile (TILE) and Royal Ceramics (RCL) sectors were the highest contributors to the market turnover while both sector indices decreased by 1.60% and 1.18% respectively. Premier conglomerate John Keells Holdings (JKH) made the highest contribution to the market with a crossing of 1,000,000 shares at Rs.285. The share price decreased by Rs 3.00 (1.05%) and closed at Rs 282.10. Foreign holding of the company decreased by 1,000,000 shares. Ceylinco Insurance (CINS) and HNB attracted investors despite the negative market momentum. Subdivision of HNB is to take effect from 31 March 2011. Illiquid counters Guardian Capital Partners (WAPO), Carsons Cumberbatch (CARS) and Bukit Darah (BUKI) which recorded rapid gains in the recent past were the main negative contributors to the indices. The All Share Price Index (ASPI) was uneasily in green during early trading on the Monday the 7 March 2011 while the Milanka Price Index (MPI) was more in red. However, profit taking across the board closed the ASPI deeper in the red. The All Share Price Index (ASPI) closed at 7,582.55 points, dropped 1.07% by 82.17 points and the Milanka Price Index (MPI) closed at 7,582.55 points, dipped 0.19% through 13.55 points. 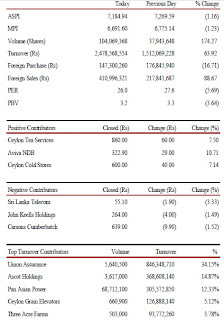 Total turnover was at Rs.3.1 billion dropped 25.8% with a total of 133.22 million shares changing hands (fell 16.31%) and there were 56 gainers and 119 losers. Foreign purchases record to be Rs.596.38 million (down 85.75%) and foreign sales recorded to be Rs. 584.76 million (down 135.76%). Price to forward Earnings Ratio (PER) was dropped by 0.03% to 28.7 times. 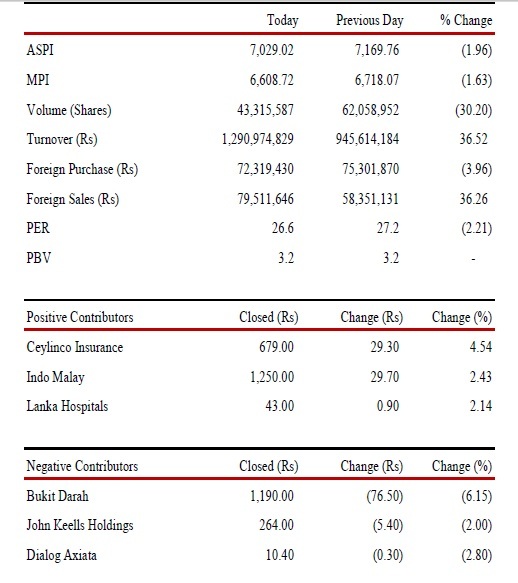 Bank Finance & Insurance due to National Development Bank (NDB) and Manufacturing due to Piramal Glass (GLASS) sectors were the highest contributors to the market turnover. Bank Finance & Insurance index decreased by 0.56% while Manufacturing sector index increased by 0.40%. NDB Bank made the highest contribution to the market with three crossings of 1,091,000 at Rs.353. The share price increased by Rs.4.00 (1.14%) and closed at Rs.353. Interest might have been generated by the sub-division which is to be taken effect from 30 March 2011 according to brokers. 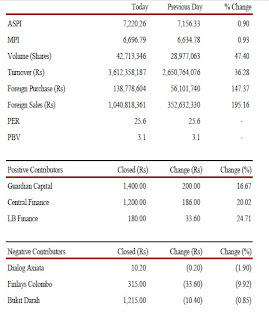 Laugfs Gas (Non-voting) (LGL.X) surprisingly attracted institutional and high networth investors despite the Petroleum Minisitry deciding to withdraw exclusive rights given to the company to buy the entire LPG production of the Ceylon Petroleum Corporation. 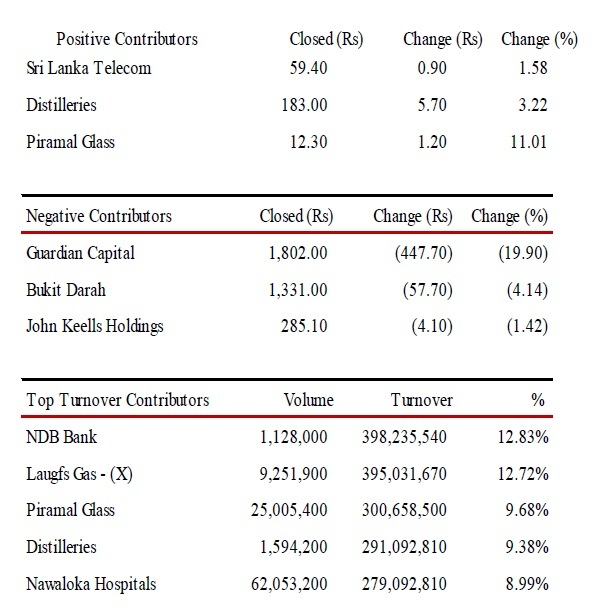 Retail investors showed interest in Distilleries (DIST) amidst the selling of the stake in “Lanka Hospitals” at a substantial capital gain. Guardian Capital Partners (WAPO) which has risen in an unnatural manner over the last few weeks, topped the negative contributors. 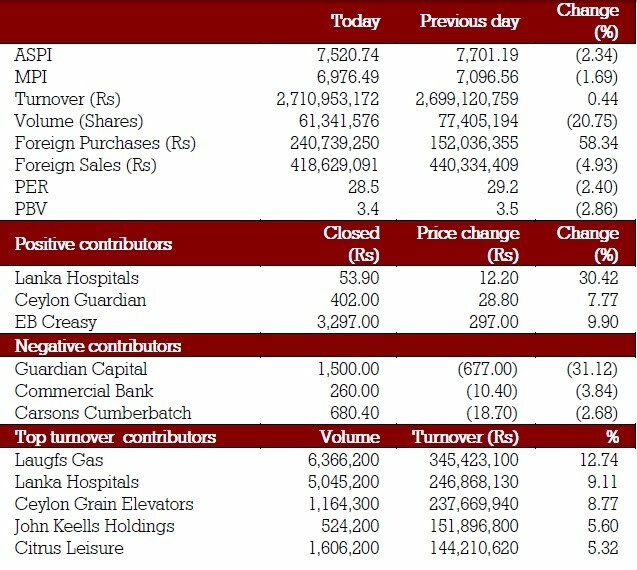 Indices recovered from earlier day’s sharp dip on Friday the 4 March 2011, while the market turnover surged to its highest since late December 2010 supported by a crossing in Lanka Hospitals. The week, which witnessed large fluctuations in the All Share Price Index (ASPI), concluded with ASPI and Milanka Price Index (MPI) declining 2.29% and 1.95%, respectively. The All Share Price Index (ASPI) closed at 7,664.72 points, topped 1. 91% by 143.98 points and the Milanka Price Index (MPI) closed at 7,029.42 points rose up 0.76% through 52.93 points during the day. Turnover was at Rs.7.6 billion (up (183.42%) with a total of 159.18 million shares changing hands (rose (159.51%), foreign purchases rose by 1638.02% to Rs.4.18 billion and foreign sales dipped 40.75% to 248 million. Price to forward Earnings Ratio rose 1.75% to 29 times. Health care and manufacturing sectors were the highest contributors to the market turnover while sector indices increased by 0.74% and 1.98% respectively. Lanka Hospitals (LHCL) made the highest contribution to the market turnover with a crossing of 64,120,915 shares at Rs.62 while the share price decreased by Rs 3.00 (5.57%) and closed at Rs.50.90. Several other crossings were recorded including two crossings of Ceylon Grain Elevators (GRAN) 3,9 million shares at Rs.205, Laugfs Gas (LGL) two crossings 1,313,500 at Rs.55 and another crossings of 2 1,152,300 shares at Rs.53, Hemas Holdings (HHL) three crossings 2,6 million shares at Rs.46.50, Aitken Spence Hotels (AHUN) 500,000 shares at Rs.102 per share. Globally, U.S. stocks posted gains as the Dow reached its highest in three months on a strong reading on the employment data and a drop in oil prices. Dow was up 1.6%. Asian stock markets posted solid gains, cheered by Wall Street’s gains, and optimism over US job data. Nikkei was up 1%. Sri Lanakan Secondary Debt Market Treasury bond yields were mostly higher, while the market activity was dull. Sri Lankan Rupee appreciated as the exchange rate was recorded at Rs.110.37 to Rs.110.42 per US Dollar. 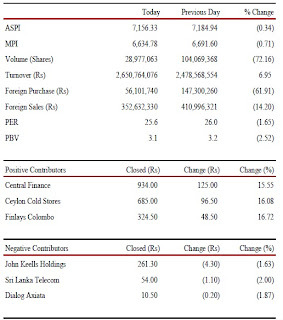 Was it the long expected correction at Colombo Stock Exchange? Heavy selling during early trading saw the indices drop sharply on Thursday the 3 march 2011 while profit taking continued and the activity got subdued at the end amidst stagnant market conditions. However, Lanka Hospitals (LHCL) and Ceylon Guardian (GUAR) attracted investors. The All Share Price Index (ASPI) closed at 7,520.74 points, dropped 2.34% through 180.45 points and the Milanka Price Index (MPI) closed at 6,976.49 points, fell 1.69% by 120.07 points during the day. Total turnover was at Rs.2.7 billion rose 0.44% with 192 gainers and 26 losers. Foreign purchases rose 58.34% to Rs.240.73 million and foreign sales dropped 4.93% to Rs.418.6 million compared to earlier market day. Price to forward Earnings Ratio (PER) slightly dropped 2.4% to 28.5 times. Bank, Finance & Insurance and Manufacturing sectors were the highest contributors to the market turnover while sector indices decreased by 2.34% and 2.37% respectively. Laugfs Gas (LGL) made the highest contribution to the market turnover with three crossings of 4,604,100 shares at Rs.55 while the share price decreased by Rs.0.60 (1.14%) and closed at Rs 51.80. 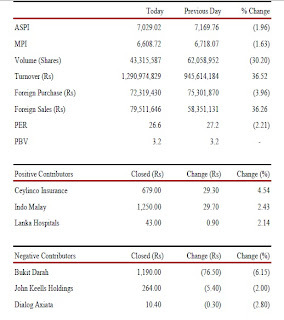 Several crossings were recorded including Ceylon Grain Elevators (GRAN) two crossings amounting to 1 million shares at Rs.205 per share, John Keells Holdings (JKH) 200,000 shares at Rs.290, Citrus Leisure (REEF) 1.5 million shares at Rs.90, Sampath Bank (SAMP) 200,000 shares at Rs.290, Commercial Bank (COMB) 323,000 shares at Rs.270, Coco Lanka (COCO.N) 372,395 shares at Rs.88 and Coco Lanka-Non Voting (COCO.X) 414,270 shares at Rs.60 per share. Globally, U.S. stocks finished a touch higher after the previous session's sharp selloff, even as crude oil rose above $100 a barrel and gold rose to a new record. Dow was up 0.07%. Asian stock markets were higher as many investors took the opportunity to buy into beaten-down stocks. Nikkei was up 0.7%. Sri Lanka Secondary Debt Market Treasury bond yields were almost unchanged, while the market activity was dull. Sri Lankan Rupee appreciated as the exchange rate was recorded at Rs.110.65 to Rs.110.67 per US Dollar. Colombo All Share Price Index (ASPI) dipped on Tuesday the 1 March 2011 amidst selling witnessed on certain illiquid counters which experienced rapid price fluctuations during last few days. Continued profit taking across the board weighed on the indices as well, whilst considerable institutional and high networth activity was also witnessed. The All Share Price Index (ASPI) closed at 7,701.19 points, dipped 1.24% by 96.77 points and the Milanka Price Index (MPI) closed at 7,096.56 points, dropped 0.62% by 44.36 points during the day. Total turnover was at Rs.2.699 billion topped 22.86% and foreign purchases rose 26.76% at Rs.152 million and foreign sales Rs.440.3 million increased by 143.54%. However, price to forward Earnings Ratio depreciated 1.02% to 29.2 times. Bank, Finance & Insurance and Manufacturing sectors were the highest contributors to the market turnover while sector indices decreased by 0.71% and 0.75%respectively. Guardian Capital-(Rights) (WAPO.R) made the highest contribution to the market turnover while the share price decreased by Rs.2,878.40 (99.48%) and closed at Rs.500. Several crossings were recorded including three crossings of Commercial Bank (COMB) 564,500 shares at Rs.270, Lanka Floortiles (TILE) 1 million shares at Rs.130, Sampath Bank (SAMP) two crossings of 200,000 shares at Rs.290, Asian Alliance (AAIC) 750,000 shares at Rs.145 , Dialog Axiata (DIAL) 1,707,600 shares at Rs.11.50, Hemas Holdings (HHL) 747,700 shares at Rs.47.50, Ceylinco Insurance (CINS) 50,000 shares at Rs.560 and Lanka Ceramics 192,000 shares at Rs.148 per share. Singer (Sri Lanka) (SINS) announced a final dividend of Rs 3.50 per share. Singer Industries (SINI) announced a final dividend of Rs 2.00 per share. Regnis (Lanka) (REG) announced a final dividend of Rs.6.00 per share. Sri Lanka Secondary Debt Market Six months yields were down in Treasury Bill primary auction. Secondary market Treasury bond yields were up, while the market activity was relatively low. Sri Lankan Rupee appreciated as the exchange rate was recorded at Rs.110.63 to Rs.110.68 per US Dollar. 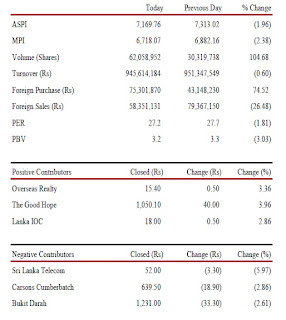 Colombo All Share Price Index (ASPI) continued to gain with the price appreciations seen on illiquid counters in Investment and Motor sectors along with Carsons (CARS) and Bukit Darah (BUKI) Laugfs (LGL), Lanka Walltile (LWL) and Dialog (DIAL) attracted investors on Monday the 28 February 2011 although profit taking was witnessed in most counters. The All Share Price Index (ASPI) closed at 7,797.96 points rose 1.12% and the Milanka Price Index (MPI) closed at 7,140.92 points, dipped 0.40% as at the end of trading day. 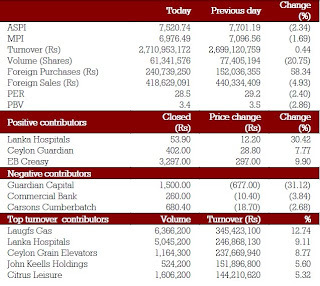 Turnover recorded to be Rs.2.2 billion dropped 27.54% with 77 gainers and 147 listed losers. A total volume of 63.58 million shares changed hands (down 4.93%) whilst the foreign purchases dropped 52.17% to Rs.119.9 million and foreign sales fell 30.34% to Rs.180.8 million. Price to forward Earnings Ratio (PER) appreciated by 1.03% to 29.5 times. Guardian Capital (WAPO) closed at Rs.2,913.30 rose by Rs.971.10 at 50% amidst rights trading that is yet to commence on next day while Carsons Cumberbatch (CARS) closed at Rs.700 appreciated by Rs.22.90 at 3.39% and Finlays Colombo (JFIN) closing at Rs.379 rose by Rs.97.80 at 36.22% during the day. Bank, Finance & Insurance and Manufacturing sectors were the highest contributors to the market turnover while sector indices decreased by 0.40% and 1.26% respectively. Laugfs Gas-(Non-Voting) (LGL.X) made the highest contribution to the market turnover while the share price increased by Rs.0.50 (1.20%) and closed at Rs.42.30. Several crossings were recorded including one million The Finance (TFC) shares at rs.45 and 150,000 LB Finance (LFIN) shares at Rs.299, Ceylinco Insurance (CINS) 150,000 shares at Rs.555 with 130,000 Asian Alliance (AAIC) shares at Rs.161 per share. Soflogic Finance (CRL) announced an interim dividend of Rs.1 per share. Globally, most Asian stock markets were mixed as a surge in oil prices amid continued worries over the Middle East hit airline stocks and dampened sentiment. Nikkei rose 0.3%. 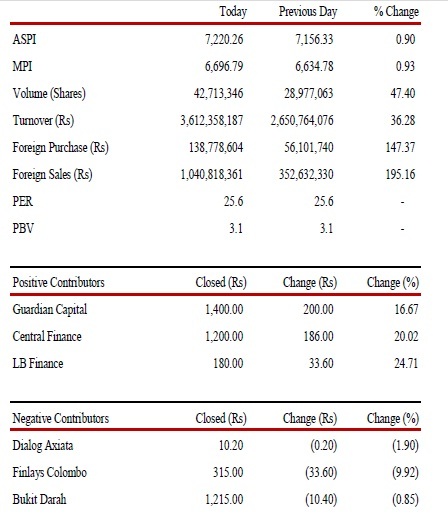 Sri Lankan Secondary Debt Market Treasury bond yields were slightly up, while the market activity was relatively low. Sri Lankan Rupee depreciated as the exchange rate was recorded at Rs.110.79 to Rs.110.80 per US Dollar.